We offer 2 types of storage solutions. The Flow Rail System and the Spring Rail System. These 2 unique pallet storage systems are designed to increase storage capacity as well reduce stacking and retrieval time. By keeping the pallets pushing forward, the fork lift operator does not have to spend time manipulating the pallets and fork lift to gain functional access. Check with a AutoSysCon representative for information about experiencing and testing a live test system in your plant. FLOW RAIL is a high-density pallet storage system for use with conventional forklift trucks. It is a non-motorized, last in/first out system that can hold from 3 to 10 pallets deep. 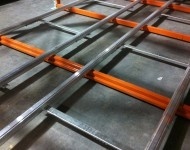 The rails are installed level and are not inclined. 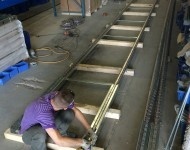 FLOW RAIL can be installed on existing beams & uprights, existing rack, new or used rack. Video presentation of the Flow Rail System in use! This video shows the Spring Rail System in action! We offer a 30-day trial period to determine if the system will work for you! Call AutoSysCon for more information and to schedule a test system installation! To see more photos of the product in action, or other documentation, visit the SunRing website or click on the button below and send us an email! Send me more information!Send me more information!